Today Green Party candidate Rosamund Adoo-Kissi-Debrah welcomed Green Assembly Members Sian Berry and Caroline Russell to Lewisham East - where they immediately came face to face with the South Circular. 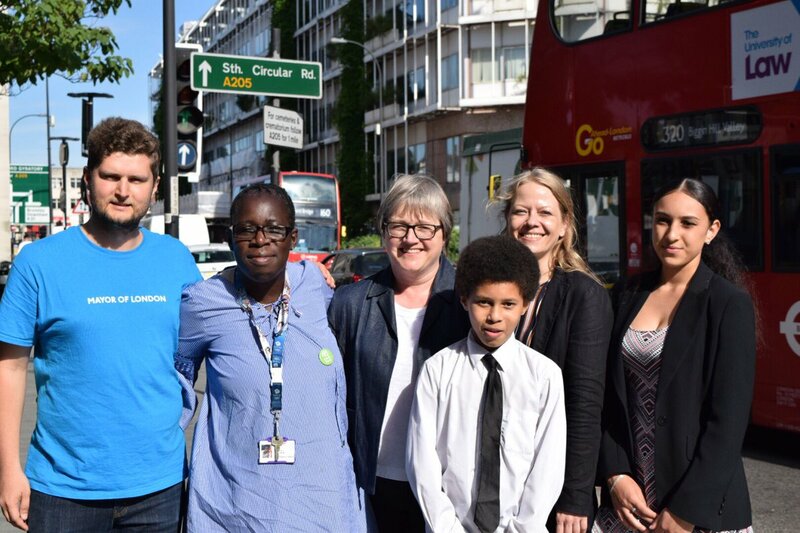 Long-term air pollution campaigner and charity founder Rosamund has previously worked with the Assembly members in a bid to bring the Mayor's proposed extension to the Ultra Low Emission Zone (ULEZ) to Lewisham East. Under current plans much of the borough is being left behind, meaning that cleaner air will only be on offer to those who can afford to live most centrally. The foundation is named after her daughter who died in 2013 from a rare and severe form of asthma. Speaking about Lewisham's toxic air, Rosamund said: "Lewisham has one of the highest rates of ashtma in the UK. In London THREE children in every class has an asthma diagnosis. Now overwhelming evidence points to a direct link between the toxic air we breathe and the onset of asthma." She described current government plans to tackle the crisis as "toothless": "It's vague, it's not going to be helping the people of Lewisham East. He needs to be bringing in a diesal scrappage scheme now". Scrappage schemes provide financial incentives for members of the public and/or businesses to trade in older more polluting vehicles, potentially saving lives. Sian Berry, former Mayoral candidate who was visiting Catford for the first time said "We've got a thundering road here. You can smell the pollution, you can hear the pollution. Absolutely needs dealing with." Caroline Russell added "This is a street with shops, people walking, people going about their everyday lives and still to have all the polluting vehicles. "No Londoner should be left out of the clean air zone"
Both Berry and Russell encouraged residents to vote for Rosamund Adoo-Kissi-Debrah on Thursday, as the only candidate who will relentlessly work to clean up Lewisham's toxic air.